One of my favorite shoe trends of this season are mules or slides. You'll see them in various styles, colors, textures, and heel height. Because of that, plus the fact that they're very easy to wear--literally just slipping your feet into them, it makes mules or slides a no-brainer choice for me when it comes to comfy shoes... next to sneakers, of course. This particular pair of mules I found from Narrnan's Instagram caught my attention because of its bold color and unique mesh detail. 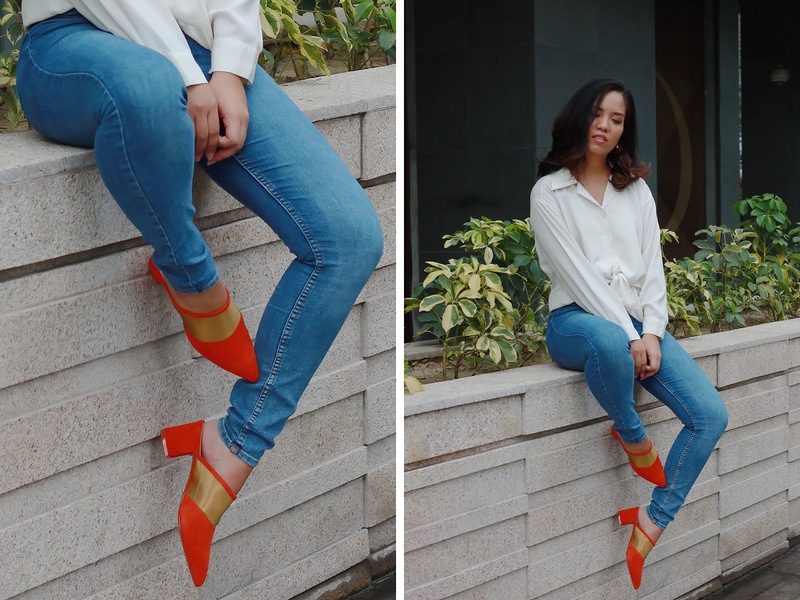 I thought it would add instant chic points to my work and weekend wardrobe, so I put it to the test. My go-to work outfit involves a pair of jeans and a nice top. My office isn't strict with dress codes, but as it is an office, still, it's good to present yourself well. This is the easiest way for me to go casual while looking like I put some effort in. The top I'm wearing is loose and flowy, so I paired it with a more fitted bottom. Threw on these orange Narrnan mules for a pop of color and burgundy fabric earrings (that you can barely see LOL) to finish off the look. It sounds basic when you hear it, but because of the bold color, the outfit has a bit more character now. Depending on your office's dress code, you can play around with styling your mules for work. You can wear it with a dress or even culottes. Just give it a go. You'll never know unless you try! Took over Local Edition's space to shoot this outfit, so thank you, Local Edition! On weekends, which I typically spend either running errands or, in this case, having coffee with my bestfriend, I like wearing rompers or jumpsuits. They're easy to slip into and always makes me look very put-together with minimal effort. Going to the bathroom, however, takes 100x more effort! #RomperProblems LOL. The one I'm wearing is a favorite because of the color and the print! And because the shoes had such a standout color, I wanted to style this pair of mules a bit more playfully for the weekend. Threw on my new pair of bright blue pompom earrings and this woven bag I got as a gift from Bali from my brother and sister-in-law, and there you have it! Now that I've been exposed to the corporate world for about 6 years now (gasp! ), my style has definitely adapted to my lifestyle. My looks are a lot more relaxed and polished, with a hint of romance. And no, I'm not talking about my love life. Haha! My style is just more tita now. Which look is more your style? Leave them in the comments! You can get your Narrnan pair from @narrnanshoes on Instagram, Facebook, or Shopee.